A man seriously injured while being arrested did not receive medical treatment for eight hours, a police watchdog report has revealed. The 41-year-old made several complaints about his knee to officers after an incident at a Falkirk pub last April. A Police Investigations and Review Commissioner (Pirc) report said he was eventually prescribed ibuprofen and paracetamol by a police nurse. He was diagnosed with a fractured knee cap following his release from custody. The Pirc report recommended that Police Scotland remind the custody officers involved in the case to make arrangements for anyone complaining of an injury to be examined by a health care professional "as quickly as possible". The report said officers approached the man with the intention of arresting him in connection with the incident at the pub. The officers took hold of the man, who began to struggle. One of the officers then swept the man's legs from under him, which resulted in the man landing with force on his left knee cap. 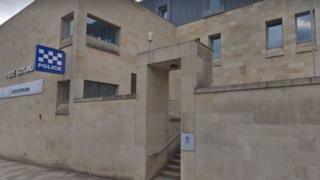 The report said that during his detention at Falkirk Police Station, custody staff were made aware by both the man and the arresting officer on at least 20 occasions over an eight-hour period that he had suffered an injury to his leg. Police Scotland said it accepted the findings and would respond to the recommendations made.